Ten years ago at this exact time of year/these exact days found me shuttling between Hampshire and Smith colleges in the Pioneer Valley of Massachusetts for a series of theatrical commitments, while also stroking anticipation for a study abroad semester to come that fall at the British American Drama Academy in London, England. While the following two years brought greater, and perhaps more memorable, professional accomplishments in the form of directing three full length plays, writing one, producing two, acting in one, playing a key role in supervising the theatre department during my senior year, and additional high – flying theatrical activities, I feel that this particular week was the most intensive of my college theatre career, and an apex of its own. I don’t recall the specific day by day activities, but I do clearly recall the anticipation and buildup of dually working towards two performances of a one act play I’d directed (“English Made Simple”, part of All In the Timing by David Ives) on that Thursday and Friday night, April 29 and 30, to be immediately followed by a one-off Richard Foreman devised theatre performance that Saturday afternoon, May 1, which had its final rehearsal late on the same Friday night. Simultaneous to all this was ongoing preparatory work for Hampshire’s New Play Festival the following weekend, for which I was serving as festival producer and director of two short plays. I remember going back to my room in Mod 4 and feeling nothing but exhilaration and excitement. This was what it must be like to be on top of the theatre game. And unlike (i later learned firsthand in) the professional world where you may or may not be just a jobbing actor, this was all among friends and had a shared sense of accomplishment, creativity and collaboration. Following the successful Foreman performance, we half-jokingly wanted to take it on the road. The previous day, the Smith festival of directors (which, amusingly, featured mostly Hampshire students,) had a slightly different, though equally appealing, feel of “this is something new and I could go somewhere with this” – where it was my first major theatre directorial experience. It’s unfortunate that (I’ve found) college theatre experiences get somewhat downplayed after a certain point in the professional world. 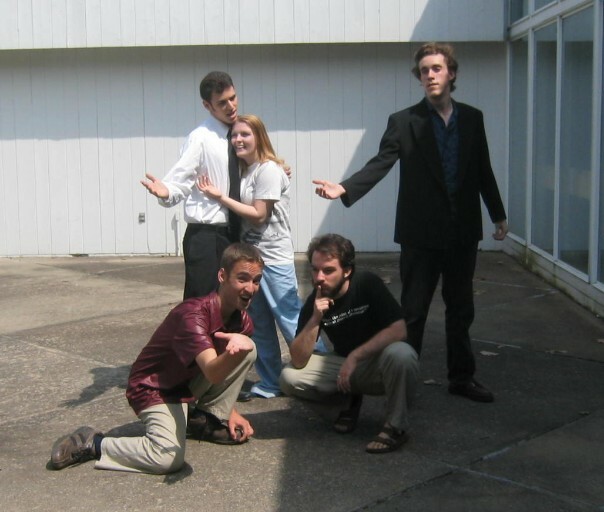 And, as I noted yesterday, it’s now close to a decade since my last college theatre experiences. But there’s something about that spirit of collaboration that still stands out now many years later, and I feel grateful to have reconnected with at certain times in my professional theatre career. And I wouldn’t be here in my current Ann Arbor life if I hadn’t had that particular Hampshire College – based theatre career. So I think the impetus for this post is: be grateful for your college accomplishments. don’t forget about them. and let those memories carry you to something even more creative and exhilarating when the time is right. Richard Foreman performance: featuring actors myself, Russ, Abby and Nate, with our director Shawn looking pensive. Posted on April 29, 2014, in Theatre. Bookmark the permalink. 3 Comments. That was quite a busy time (especially the semester when that picture was taken) – I miss that group and that atmosphere.